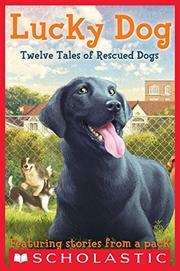 Thirteen dog-loving authors contribute 12 short stories about dogs at the Pawley Rescue Center and the humans who love them. An 11-year-old sick of his fighting parents and their “bird’s-nest” custody arrangement (he stays in the family house while they move in and out) finds comfort in the floppy-eared rescue he names Bird Dog. Friendship between their dogs leads to peace between a bully and his target. An opinionated Pomeranian befriends an Old English sheepdog and pitches a fit when an adoptive family takes her home without her One and Only Truest Best Friend in the World. Some stories are told from a kid’s perspective and others from a dog’s, but every one tugs at readers’ heartstrings as dogs and humans are brought lovingly together. The bleaker side of animal shelters is left unaddressed; readers are led to understand that dogs who don’t get adopted might be lonely, but no reference is made to what happens when Pawley’s kennels are full. (There is, however, a graphic anecdote about the demise of two Siamese fighting fish unwisely put into the same tank.) There’s nothing wrong, however, with letting dog stories stay uplifting, and these will easily bring tears to dog lovers’ eyes.